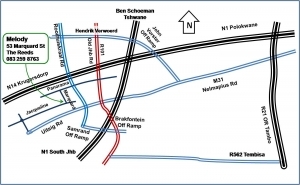 From the N1 – Ben Schoeman take the R101 – Old Johannesburg Rd offramp. Turn onto the R101 towards Pretoria, past the SASOL garage on left. Continue to second traffic light, approximately 1,5 km further and turn left into Uitsig Rd. Continue with Uitsig for approximately 3 km and past one traffic light and two four-way stops. Follow Uitsig Rd through 90 degree bent to mini circle intersection with Jacqueline St. Turn right into Jacqueline St and continue for another 1km to entrance to Melody at the corner of Marquard St.